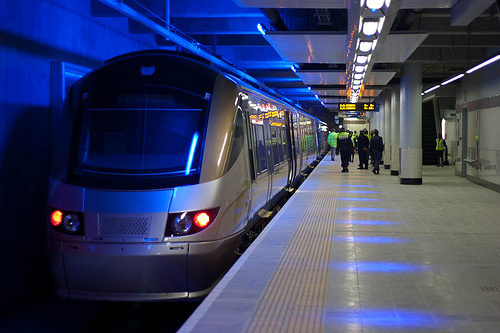 The Gautrain under its blue lights at Sandton Station, one of four open stations on the high-speed train's airport route. Photo via fmgbain. Sports fans around the globe are all going a bit insane from listening to the incessant drone of South Africans’ blow horns, the Vuvuzelas. But we think Africa’s first high-speed train, the Gautrain, deserves some horn-tootin’. 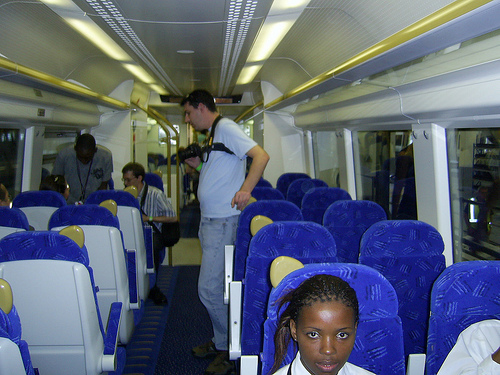 Over the World Cup’s opening weekend, approximately 40,000 passengers rode the Gautrain – several times the anticipated volume, according to Kelebogile Machaka of Bombela Concession Company Ltd, Gautrain’s operator. Except for long lines at the stations – exacerbated since everyone needed to buy their passes – the Gautrain coasted through its first weekend, running at 160 kilometers per hour at eight-minute intervals. Aileen Carrigan, a transport and urban planning expert from EMBARQ (the producer of this blog), will be in South Africa over the next couple of weeks to check out the Gautrain, Jo’burg’s BRT, and other transit-related issues. So stay tuned for more updates on how the World Cup is improving sustainable mobility in South Africa. World Cup fans take the Gautrain from the OR Tambo International Airport. Photo via Shine 2010 - 2010 World Cup good news.